The Arroyo Willow is a common site in creek and riverbed Chaparral and mixed sage scrub. 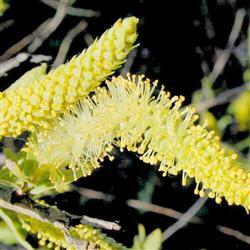 It is a commonly in a shrub form, but can easily shaped to tree proportions. The leaves are a dull green, with white, perpendicular midveins and fuzzy beneath. The twigs are a reddish, brown and accent the leaves, which turn in the fall. The tree is useful to many bird and butterfly species.